Barbara Edelstein's artworks continually reflect water as both a concrete material and an abstract concept - a dualism that bridges the natural and artistic worlds. As the essence of existence, water symbolizes life. The flow of water communicates a motion that transcends time. Edelstein, internationally known for her astonishing outdoor and delicate indoor fountains, introduced video into her work for the first time in 2007 in the exhibition "Language/Environment" at the Museum of Contemporary Art Beijing, Beijing, China. Each of the four individual videos, screened here for the first time together, show the gentle movement and soft reflection of vines, Ginko, and Willows, as well as Lotus leaves on the water. 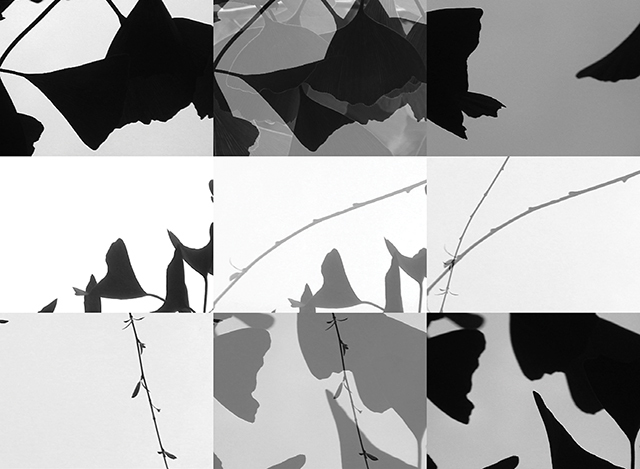 Silently transformed into abstraction through the use of under- and over-exposed light, the video reflect Edelstein's ongoing observations of the intricacies of nature's wisdom. By using leaves from around the world in the same artwork, in her own way, she is unifying the world, bringing everyone and everything together into one. Barbara Edelstein: Video is curated by Jennie Lamensdorf and sponsored by the Time Equities Inc. (TEI) Art-in-Buildings. TEI is committed to enriching the experience of our properties through the Art-in-Buildings Program, an innovative approach that brings contemporary art by emerging and mid-career artists to non-traditional exhibition spaces in the interest of promoting artists, expanding the audience for art, and creating a more interesting environment for our building occupants, residents, and their guests.